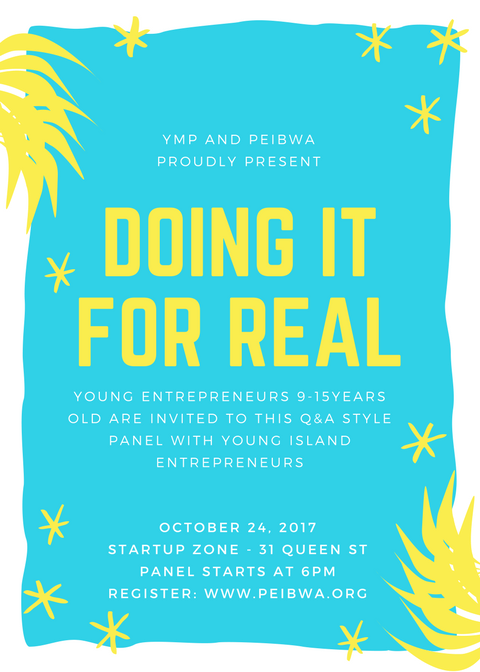 The Young Millionaires Program is hosting an event at Startup Zone on October 24th with the goal of introducing the kids to entrepreneurs who are Doing it For Real. This will be offered to YMP participants and other young entrepreneurs from ages 9 - 15. It will be a Q&A style setting with a small panel. They will introduce themselves and their businesses and answer some questions about what running their own company is like. Confirmed panelists are Joshua and Oliver from Forktula, Lacey Koughan from 24 Strong/24 Dance PEI, Katharine MacDonald from Of the Island and Jess MacAulay from Fabrications. This event is free to attend and open to all young entrepreneurs and budding entrepreneurs.